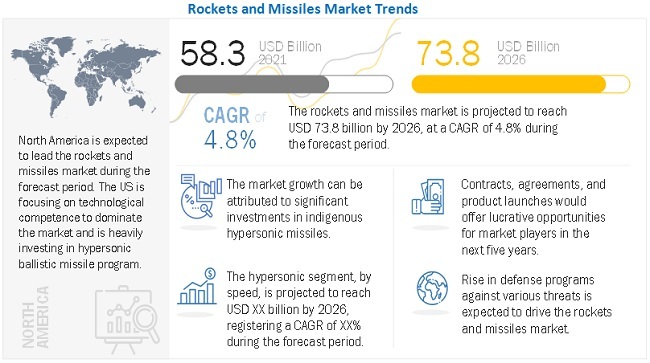 [182 Pages Report] The rocket and missile market is projected to grow from USD 55.53 Billion in 2017 to USD 70.00 Billion by 2022, at a CAGR of 4.74% during the forecast period. 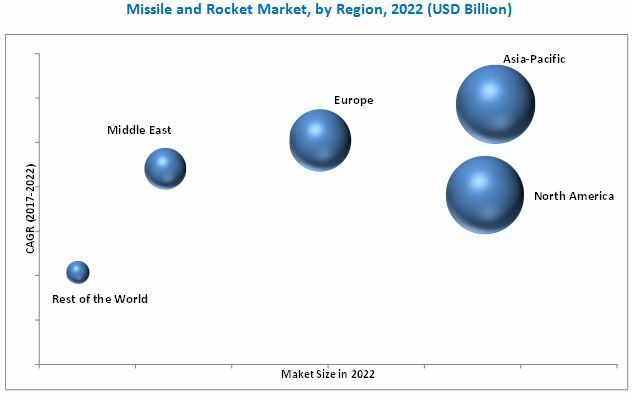 This report covers the forecast of the rocket and missile market and its dynamics over the next five years, while also recognizing market application gaps, recent developments in the market, and high potential countries. The rocket and missile market has been analyzed primarily based on type (missile, rocket), propulsion (solid, liquid, hybrid, ramjet, turbojet, scramjet), launch mode (surface-to-surface, surface-to-air, air-to-surface, air-to-air, subsea-to-surface), and region through the period of 2017 to 2022, considering 2016 as the base year. The market size estimations for various segments and subsegments of this market were arrived at through extensive secondary research that included government sources such as the U.S. Department of Defense (DoD), the U.S. Army website, company websites, corporate filings such as annual reports, investor presentations, and financial statements, and trade, business, and professional associations, among others, corroboration with primaries, and further market triangulation with the help of statistical techniques using econometric tools. All percentage shares, splits, and breakdowns were determined using secondary sources and verified through primary sources. All possible parameters that affect the market covered in this research study were accounted for, viewed in extensive detail, verified through primary research, and analyzed to obtain the final quantitative and qualitative data. This data was consolidated and added with detailed inputs and analysis from MarketsandMarkets, and presented in this report. The ecosystem of the rocket and missile market comprises OEMs, integrators, and end users. Key end users of the rocket and missile market are defense forces. Major players in the rocket and missile marketare Lockheed Martin Corporation (U.S.), MBDA Inc. (U.K.), Saab AB (Sweden), Raytheon Company (U.S.), Roketsan A.S. (Turkey), Rafael Advanced Defense Systems Ltd (Israel), and General Dynamics Corporation (U.S.), among others. Based on type, the rocket and missile market has been segmented into missile and rocket. Missiles are further segmented into ballistic missiles and cruise missiles. Ballistic missiles have a target range from a few hundred kilometers to a thousand kilometers. Based on range, ballistic missiles are further segmented into Short Range Ballistic Missile (SRBM), Medium Range Ballistic Missile (MRBM), Intermediate Range Ballistic Missile (IRBM), and Intercontinental Ballistic Missile (ICBM). The development of ballistic missiles in countries such as China and India is very high, due to the geopolitical scenario, regional disputes, and preparedness for war, among others. Based on launch mode, the rocket and missile market has been segmented into Surface-to-Surface (SSM), Surface-to-Air (SAM), Air-to-Surface (ASM), Air-to-Air (AAM), and Subsea-to-Surface (SuSM). The SSM segment is projected to grow at the highest CAGR during the forecast period. The rising demand for SSM can be attributed to several factors, including the increasing focus on close combat scenario, increasing development of cruise missiles, use of Anti-Tank Guided Missile (ATGMs) for urban warfare roles, increasing long range ballistic missile arsenal, and wide use of surface precision strike, among others. Based on propulsion, the rocket and missile market has been segmented into solid, liquid, hybrid, ramjet, turbojet, and scramjet. The market is dominated by the solid propulsion segment. Solid propulsion is widely used in ballistic missiles and in other short range missiles. The scramjet segment is projected to grow at the highest CAGR. This can be attributed to the wide adoption of cruise missiles in military arsenals worldwide. North America is expected to have the largest market share during the forecast period. One of the key factors driving the North America rocket and missile market is the continuous demand from the U.S. military and engagement in various small conflicts. Russia and China are two the major countries who are increasingly investing in rocket and missile and related technologies. The growth of the rocket and missile market could, however, be affected by certain factors in the coming years. These include declining defense budgets of developed economies such as the U.S., Canada, the U.K., and Germany and stringent technology sharing rules. Key players operating in the global rocket and missile market are Thales Group (France), MBDA Inc. (U.K.), Raytheon Company (U.S.), Rafael Advanced Defense Systems Ltd (Israel), Roketsan A.S. (Turkey), and Lockheed Martin Corporation (U.S.), among others. Contracts are the major growth strategy adopted by the top players to strengthen their position in the rocket and missile market. 12.3 Rafael Advanced Defense Systems Ltd.